In the vast majority of cases, corporate training and continuous personal development (CPD) programs are delivered by third-party providers. Usually away from the office or in another room, set aside for training and other activities. A chance for your team to get away from daily tasks and inbox pressures. Staff sees training as a chance to spend time together, do something enjoyable and get to know one another better. All of these are good reasons to continue to invest in corporate training. Team members benefit from these activities and exercises and, consequently, companies experience a ROI in the workplace. However, corporate training delivered the traditional way isn’t always the most effective method for providing knowledge to your teams. With eLearning courses and training apps, you can provide the training your staff needs without it disrupting work. Learners can engage with what they need in a modular format, in a way that is convenient for them, on tablets and smartphones, fitting it around work and other commitments. Corporate training covers a broad spectrum, from ongoing CPD to compliance micro learning to accredited training designed to support career progression, and a whole range of other educational courses in the workplace. 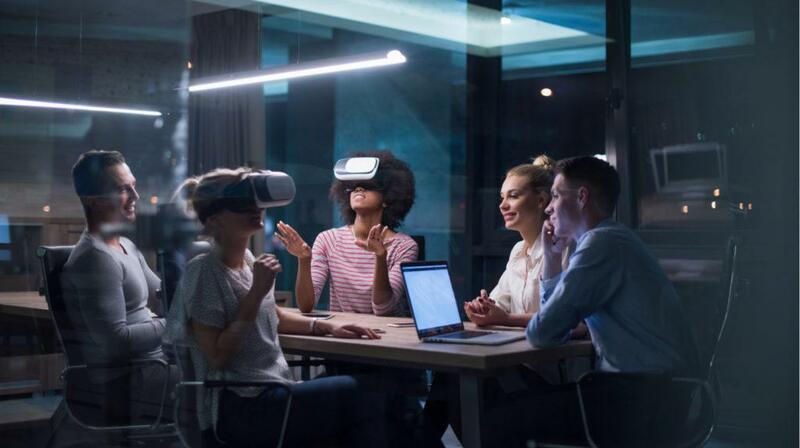 When we apply the impact of digital transformation to corporate training, it creates a promising series of opportunities to improve the experience for learners, training providers, and managers. Instructor-Led Training (ILT) isn’t the only option anymore. Instead, here are a few ways you can reimagine the corporate training environment for a new generation of learners. People in workplaces naturally compete with one another. Employers have long-since applied this knowledge in almost any environment where a rewards system based on performance improves outputs. Do the same for your training programs. Using eLearning apps, mobile and web-based, and Learning Management Systems (LMS), you can integrate a points system that rewards training performance. Rewards can be anything from in-game points and other digital tokens to praise from a manager, a certificate, bottle of wine, or connecting the learning to career progression (e.g. a promotion or bonus). Providing you make the progress and outcomes clear to everyone taking part and safeguard against cheating, then with the right app, a gamification of the process can improve outcomes and the learner experience. Your team should enjoy the experience more, and introducing an element of competition will improve knowledge retention. Hybrid or blended learning is another way that proves effective for knowledge retention. The aim of every corporate training program should be achieving a long-term ROI, which means the positive impact continues for months after the training has finished. With blended learning modules, team members can combine Instructor-Led Training (ILT) and modules they can complete on an app. Or LMS-based micro learning modules, or video training. Not only does this reduce the cost of time spent with an instructor, but it also increases the flexibility of the training being delivered. Someone can complete a couple modules on a lunch break, or at on a commute. Providing the content isn’t confidential and your team is happy to spend some time on training activities outside of work, this format can increase productivity and reduce costs. Microlearning modules are usually created to tick ongoing regulatory or compliance boxes. A popular learning format in the finance and legal sectors, for example. It’s often the case that these micro-courses don’t take up a huge amount of time and customer/client details aren’t needed to complete the training, which means it should be possible to deliver them anywhere. If, however, any secure information is needed to complete the training, learners can still access from any device, providing they’re doing so using a secure virtual private network (VPN). Instead of a manager pinging a team an email to download tools and click through a micro-course, learners can download an app and work through short modules when they’re asked via a push notification. You can also set reminders to ensure modules are completed by a certain date to make sure your staff remains compliant with regulators. Depending on the course requirements, you can also blend this learning format with another, including elements of gamification. Make your micro-courses more exciting and take up fewer office hours! Video and podcasts are incredibly popular learning formats. We consume and upload billions of hours of video every week. It has also never been easier for learning providers and corporate training teams to create video and podcast content. Now is the perfect time to create eLearning content in a format that your team is more likely to engage with, remember and apply in the workplace. With a couple of free or cheap apps, anyone can create a podcast or a video series that can be published to a corporate Intranet or private YouTube or Vimeo channel. Video or podcasts can be uploaded to eLearning apps and corporate Learning Management Systems (LMS), making it easier than ever to deliver training to staff across the business. Use push notifications to make sure modules are consumed as part of the course content when needed, to keep everyone on the correct learning path. If you want to take your corporate training one step further, use Augmented Reality (AR). With Augmented Reality as a training tool, your staff can experience learning modules in a real-world environment. AR is the same technology that hundreds of millions around the world use to play the popular game Pokemon Go. AR is ideal for training that requires some real-world interactions while using an instructor or instructional content. Walk your staff through experiences they might not have encountered yet (e.g. a new health and safety scenario). Provide new knowledge for situations that feel familiar, such as a customer service call, while making the experience similar to a game. For mission-critical learning, this could prove the most effective way yet to give your team the training they need to succeed at work. When it comes to corporate training, digital apps and tools give companies the ability to think outside of the box. Approach traditional challenges with innovative new solutions. Give your staff new ways to learn, new and improved experiences and educational modules that fit around their lifestyle and tasks at work. With a little imagination, there is no limit to what you can do on your corporate training programs.